Oris Press Release – Hölstein, 11th November 2008 – To mark Kazuki Nakajima’s debut F1 season Oris, as the Official Watch Partner of the AT&T Williams Formula One team, has created the Limited Edition Oris Kazuki Nakajima Day Date. A dynamic watch in black PVD coated stainless steel it is limited to just 1,088 pieces – all individually numbered. 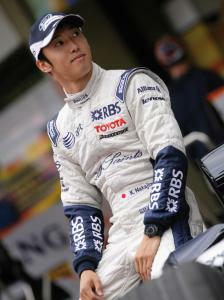 The design of the watch reflects Kazuki’s world and takes inspiration from his Williams FW30. The see through case back offers a glimpse of the mechanical movement and the famous Oris red rotor – this time with Kazuki’s logo. This powers him around the track. The rubber strap bears the distinctive F1 tyre tread pattern and the openings on the dial were inspired by the breathing slots in Kazuki’s racing helmet. The stainless steel case and crown are black PVD coated to add an extra injection of dynamic Kazuki style. Kazuki’s 2008 racing number (8) is highlighted on the minute scale top ring and his signature appears in red below the middle of the dial. The final special design feature is the second hand in the red and white of the Japanese flag. 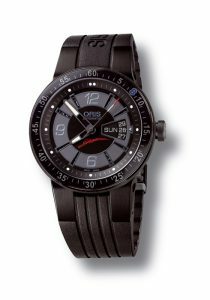 The watch has all the hallmarks of an Oris motor sport watch, including the trademark flexible lugs which ensure a perfect fit on every wrist. It’s a must for every Kazuki fan – the man himself wears number 8: an enduring reminder of his first full Formula One season. Mechanical automatic movement, centralised hour, minute and second displays. Day and date display at 3 o’clock. Two piece black dial with printed numbers. Nickel hands with luminous inlay. Multi-piece stainless steel case, black PVD coated. Applied aluminium minute scale top ring. Screwed case back with mineral glass, dial ring fitted to the case. Flat sapphire glass with inner anti-reflective coating. Stainless steel crown, black PVD coated. Rubber strap with racing tyre profile. Stainless steel folding clasp, black PVD coated. Water resistant to 10 bar/100m.